The Bosch GTL3 Professional Tile Laser is one of the most compact and portable laser levelers on the market. It’s been designed to easily tuck into a tool belt, making it the perfect level for quickly checking your work. It’s also great for extended set ups, shooting a straight line that makes installing cabinets, handling framing layout, and installing perfect trim as easy as it gets. If you need a light, portable laser level that holds a calibration well and shoots a straight line without a lot of fancy extras, the Bosch GTL3 Laser Level is a great choice. The Bosch GTL3 Professional Tile Laser level is all about portability. It’s very small, light, and easy to put in your pocket or tool belt to take out when you need it. 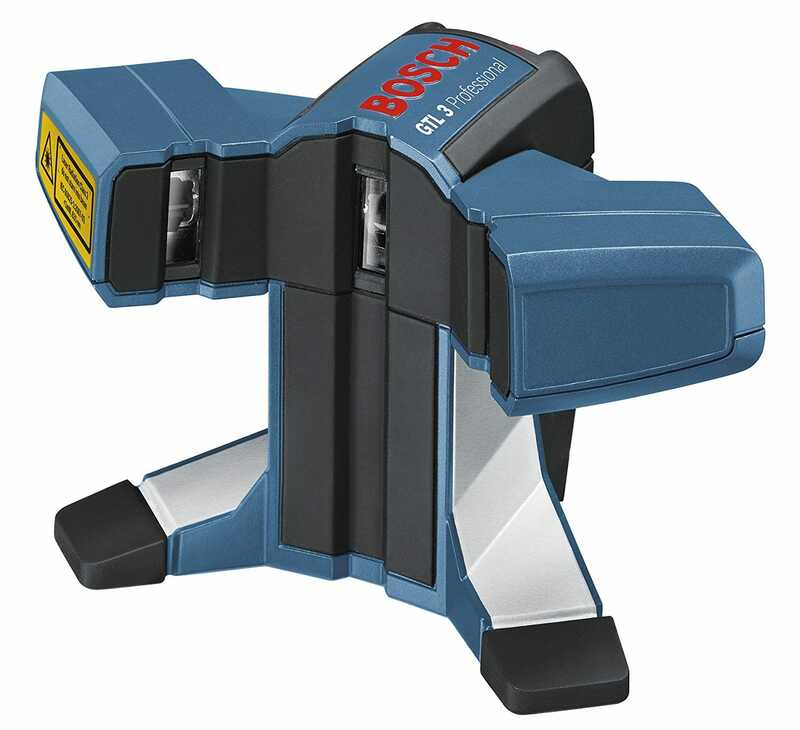 In fact, the Bosch GTL3 Laser level is the smallest laser level on the market that can shoot a 2 axis beam. While it might not have all of the features of larger, more expensive laser levelers, if portability is your key concern then the Bosch GTL3 Laser level is worth taking a closer look at. One feature that the Bosch GTL3 Professional Tile Laser does include, however, is a locking pendulum. The laser emitter is mounted on a metal pendulum to enable it to automatically find plumb and level. 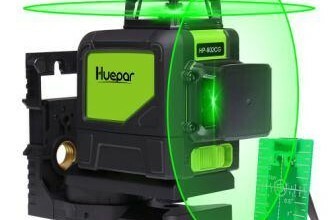 Some other laser levelers, even more expensive ones, let this pendulum swing freely when the laser isn’t in use, which can lead to the need for frequent calibration. Since the Bosch GTL3 Laser level locks this pendulum down when the level is turned off, you can take out this level and use it without calibration. Another thing the Bosch GTL3 Laser level does well is battery life. Although it only takes three AA batteries, this level can deliver over 50 hours of continuous use. One of the reasons that Bosch has been able to extend the runtime so effectively is because of the Bosch GTL3 Laser level’s simple, straightforward design. The Bosch GTL3 Professional Tile Laser has a lot going for it, but beam brightness isn’t one of its best features. If you’re planning on setting up this laser level outdoors, especially in direct sunlight, you might end up disappointed. The Bosch GTL3 Laser level is best used inside, at distances of 30’ or less, otherwise it can be hard to spot the beam. Unfortunately, this seems to be a function of the fact that the Bosch GTL3 Laser level is light, small, and has a long battery life, so the only way to improve performance is to look at laser levels that won’t fit in your pocket. 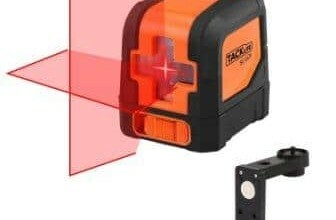 The mounting bracket for the Bosch GTL3 Laser level could really be improved upon. Although it sticks well to steel with its magnetic mount, in general the Bosch GTL3 Laser level is difficult to set up on a wall or ceiling. 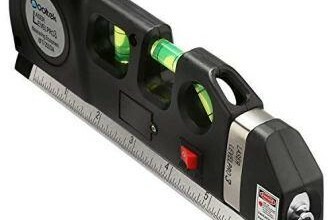 This laser level is best used when placed on the ground or better yet a tripod, which it is compatible with thanks to the threaded holes in the body of the level. Finally, one of the largest problems is the fact that the Bosch GTL3 Professional Tile Laser lacks the ability to shoot a 90-degree angle. That limits the functionality to checking plumb and level separately, so it’s inconvenient for any work where you need to keep a sharp corner. If you’re installing cabinets, the Bosch GTL3 Laser level is a great tool, but if you need to hang perfectly square drywall this laser level just isn’t up to the task. 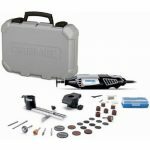 While there’s no question that the Bosch GTL3 Laser leveler lacks some of the features of more expensive tools, that’s not what it was designed to do. The Bosch GTL3 Laser level excels at being lightweight, portable, and easy to use. 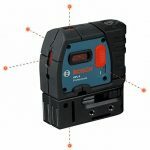 By removing a few features, most notably the ability to shoot a 90-degree line, Bosch is able to keep the price low and the battery life extremely long. Whether you’re installing trim at home or working professionally on a job site, if you want to ability to quickly and easily check for level and plumb, and to a lesser extent shoot a line while you work, the Bosch GTL3 Laser level gets the job done.